Prescribed fire is guided by detailed plans and must be conducted by specially trained staff. 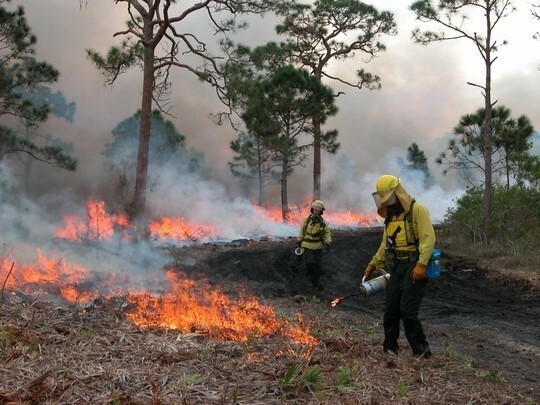 TALLAHASSEE, Fla. – The Florida Department of Environmental Protection is recognizing Prescribed Fire Awareness Week this week and the important role fire plays in protecting Florida’s natural communities. Many of Florida’s ecosystems require fire at regular intervals to maintain diversity. Prescribed fire is a safe way to ensure ecosystem health while reducing wildfire risk and protecting public safety. In fiscal year 2017-18, the Florida Park Service applied prescribed fire to 85,795 acres across the state of Florida - more than any previous year. Prescribed burning, which is guided by detailed plans and must be conducted by specially trained staff, is an important land management tool that benefits many of the nearly 800,000 acres entrusted to the Florida State Park system. Additionally, in 2018 the largest prescribed fire in Florida Park Service history was implemented at Fakahatchee Strand Preserve State Park, with 8,800 acres of marl prairie and wet flatwoods treated over the course of two days. Resources were coordinated from across the state with 32 staff members conducting the burn. Prescribed burns are used to reduce fuel loads, manage wildlife habitat, increase ecosystem diversity and assist in invasive plant control within these natural areas. Conducted with the Florida Forest Service, partnering land managers and local fire departments, this coordination ensures burns are conducted safely and efficiently. Prescribed fires are conducted only by highly trained and professional staff and only when weather conditions are suitable. Learn more about the role of prescribed fire. The Florida Department of Environmental Protection is the state’s principal environmental agency, created to protect, conserve and manage Florida’s environment and natural resources. The department enforces federal and state environmental laws, protects Florida’s air and water quality, cleans up pollution, regulates solid waste management, promotes pollution prevention and acquires environmentally sensitive lands for preservation. The agency also maintains a statewide system of parks, trails and aquatic preserves. Visit the department’s website at FloridaDEP.gov.